Summer 2105 Garden Happenings. 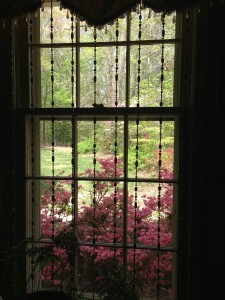 It seems that this year there’s an abundance of color and activity in the garden. I guess I could chalk it up to all the rain that we’ve received over the past few months. Slugs galore arrived with all the rain. I am not a fan of slugs at all. 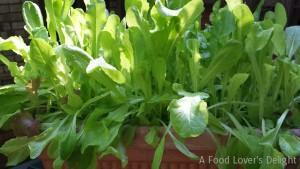 This year, I decided to plant some baby lettuces and arugula along with my potted herb garden. It was a simple planting of a few different mixtures of baby greens seeds. 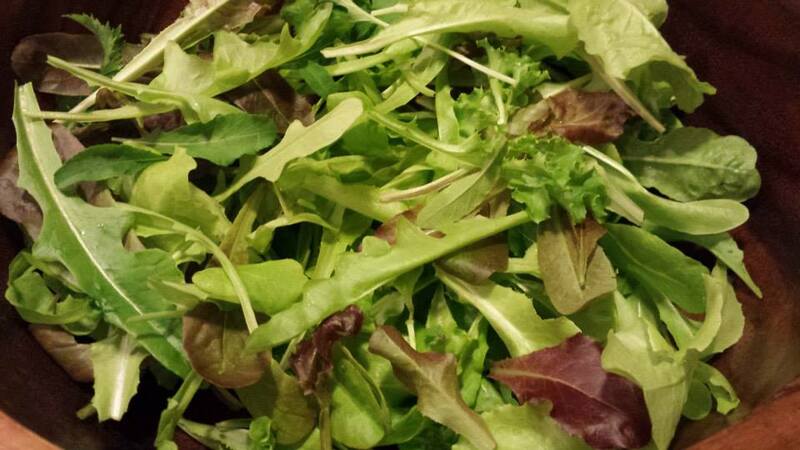 See my posting on my food and recipe site A Food Lover’s Delight for more info: How to Grow Your Own Salad. Too much rain caused one pot of baby arugula mixture to die out. Also, some teeny gray and yellow caterpillars as well as some green ones did a bit of damage until I found them and picked them off. My neighbors next door have a horse farm and a huge vegetable and herb garden. I’m lucky to share in the bounty of their efforts. Zucchini, cucumbers, tomatoes, and eggplant have been shared already this season. My neighbors are able to grow my favorite tarragon herb. Their tarragon plant is huge and has been growing for years. They’re also raising dill, fennel, and parsley. I gave them some of my basil plant babies as well. 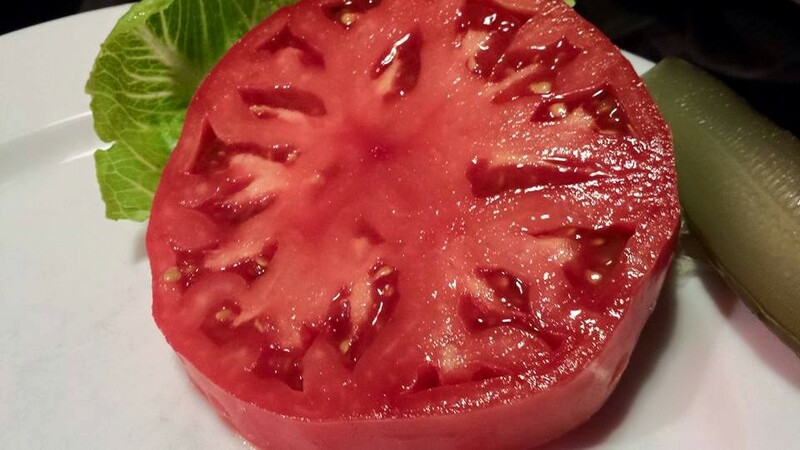 Check out this gorgeous tomato from their garden. Early in May, several different types of frogs laid their eggs in my fish-free whiskey barrel pond. 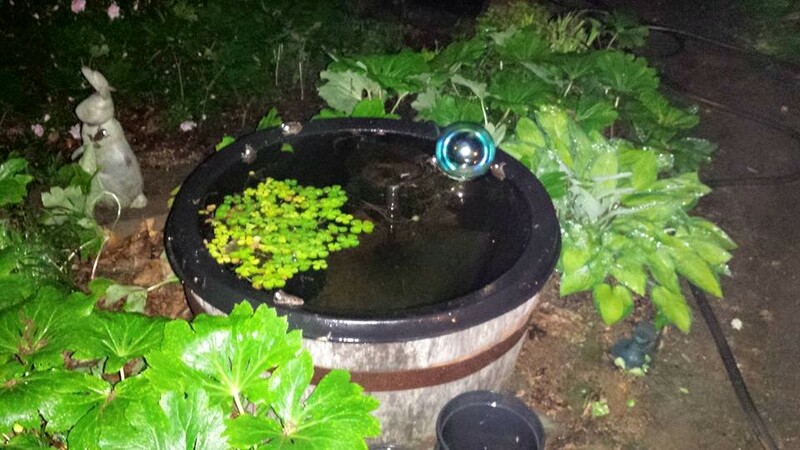 I don’t add fish to the whiskey barrel pond anymore so that the frogs have a safe haven to raise their young. The fish will eat the frog eggs in a heartbeat. I haven’t had any baby fish yet this year either. The fish eat their own eggs, too. Silly parents. 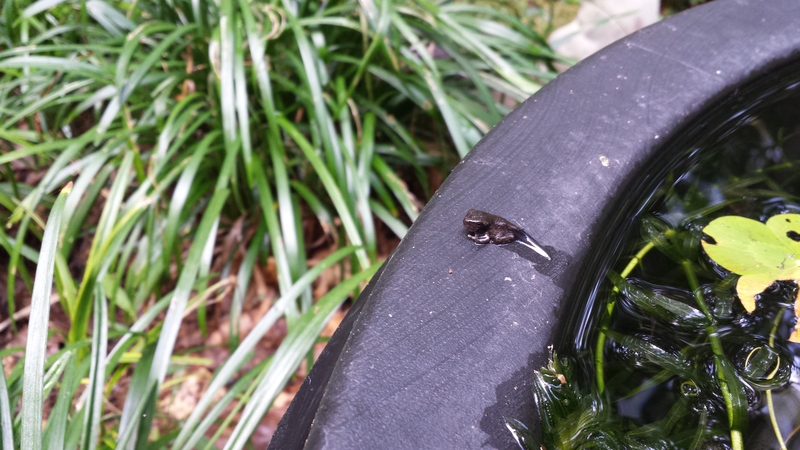 Here’s one of the first baby frogs as it emerges from the pond. Still has a teeny tiny tail! By the time I got around to “weeding” the front bed inside the driveway circle, it was full of volunteer saplings as well as other basic weeds. I did choose to leave one of the wild blackberry bushes in tact. I picked about 10 berries before the deer stopped by to eat the rest. Bambi hasn’t visited my garden a lot this year due to the bow hunter who frequents our back property in the fall. Yet when she does visit, she leaves a trail of nibbled plants. 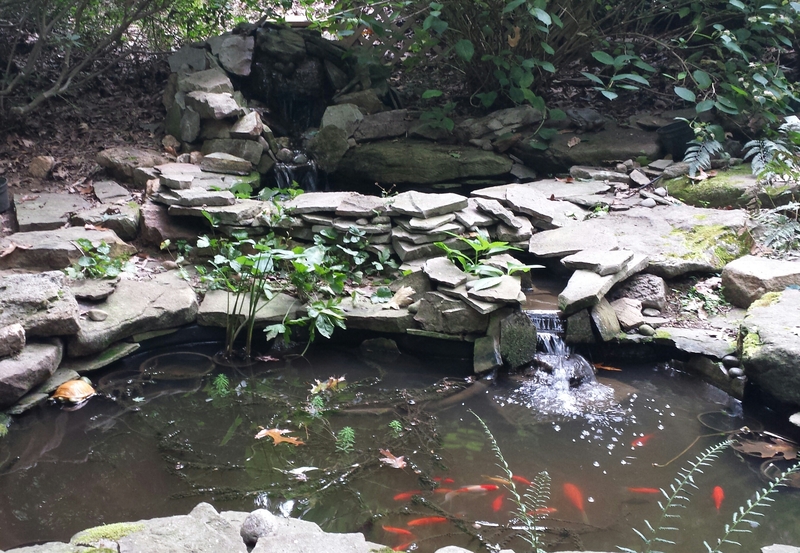 The front pond still has two remaining goldfish. I had four last year, and one passed away last fall. Another didn’t make it through the winter. The other two seem to be healthy and happy. I kept that pond’s pump on all winter including when it completely froze over with just a tiny area for the water to run through. Hard to believe the two fish made it through that chill, but they did. 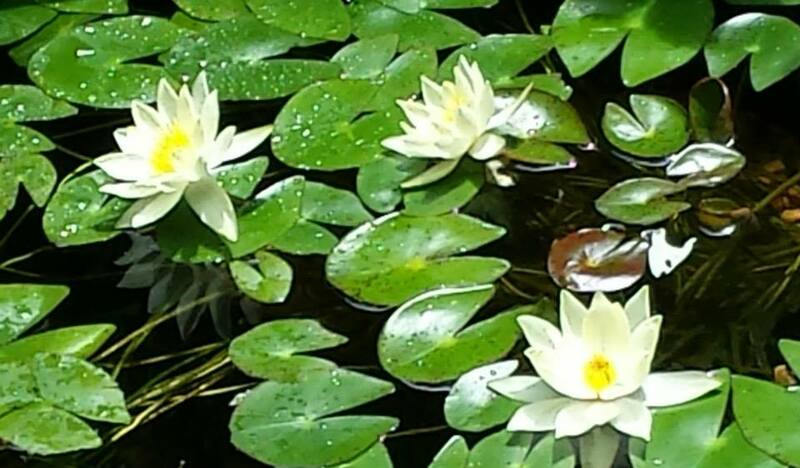 The lily pad bloomed profusely last month but seems to be on hiatus for a few weeks now. A plant that I’ve babied for years finally bloomed again this year before the deer devoured its blossoms. 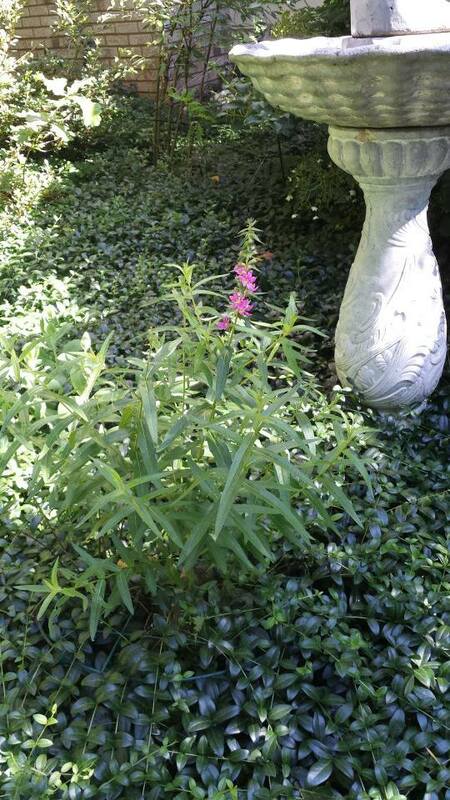 It’s a purple loosestrife. Known as an invasive plant, I’ve never seen a “volunteer” plant from it. That’s likely because the deer ate the buds before it could flower and set seed. 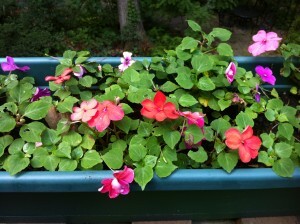 It’s a favorite plant that I brought with me from my townhouse garden. Lots of interesting insects have stopped by. 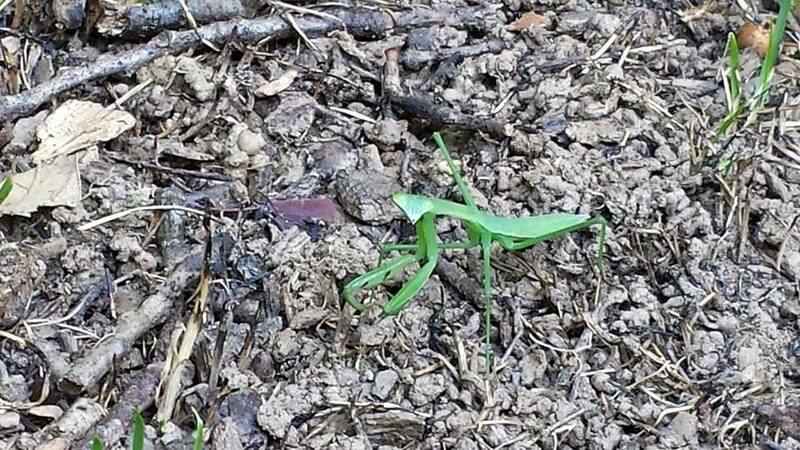 This is the first year that I’ve seen so many praying mantises! Both green and brown, they’re scooting around my landscape in record numbers. This one was so cute and “smiled” for the camera. We are visited by a number of moths. I haven’t seen a luna moth yet this year. 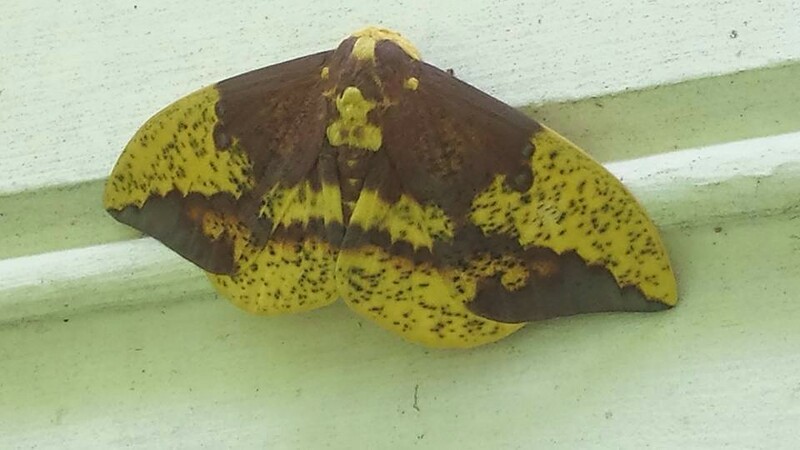 This lovely Imperial moth stopped by a few weeks ago. My butterfly bushes are huge this year. I have white ones and purple ones. 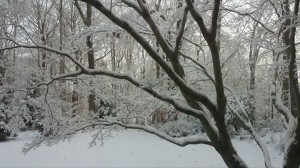 One of the white ones is at least 10 feet tall. 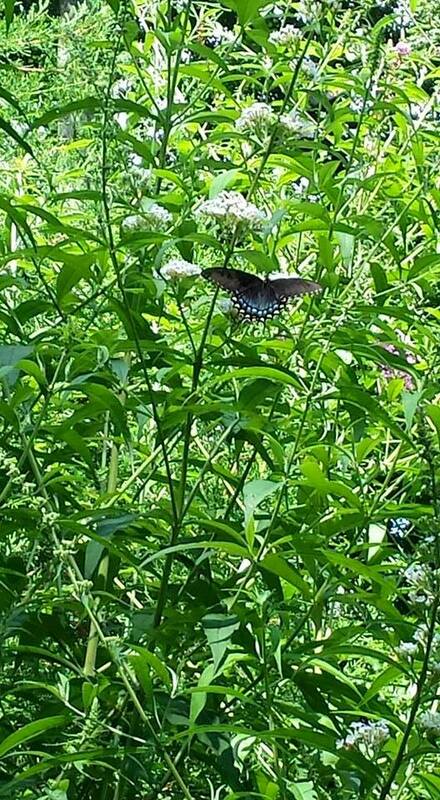 The butterflies love the bushes and stop by regularly. 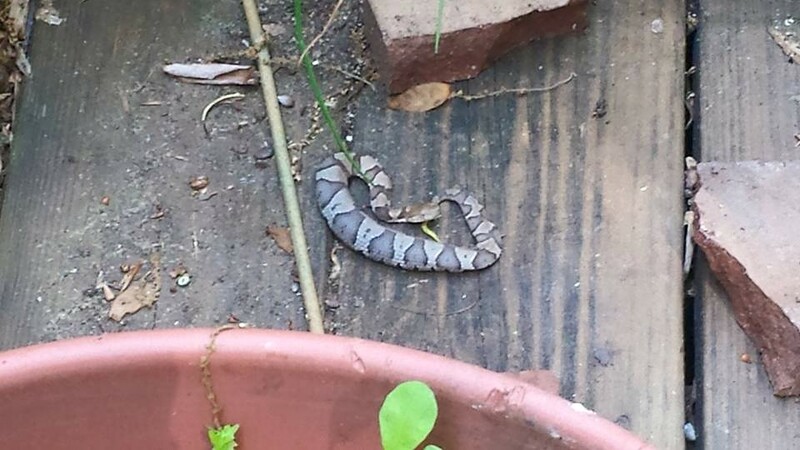 A not-so-nice visitor was a baby copperhead snake. I was moving some pots around on the deck and found this little guy. Nope, he didn’t make it and went to Snake Heaven, as my husband and I have a very strict policy on vipers since we have a dog. Our dog Atticus is more than happy to “play” with a snake. We’d rather that he didn’t and sticks around for his natural life. 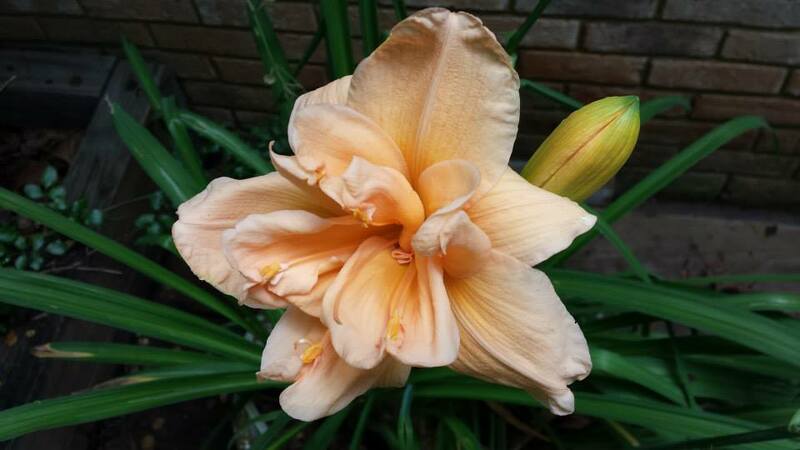 And last, but not least, my spectacular double peach day lily delighted us with a dozen blooms this year! This day lily is planted in a pot by itself. Unfortunately, the slugs got to the last set of buds so they did not bloom. It was gorgeous while it did bloom. I love day lily plants. This one is on my back deck inside the fence so isn’t attracting Bambi. Day lily plants are definitely deer candy! 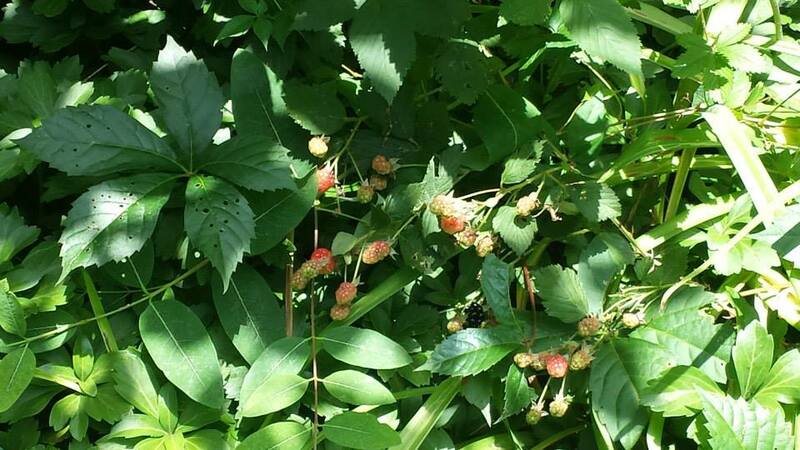 What’s happening in YOUR summer garden? Leave a comment and let us all know!